Facing the global necessity to conserve and protect our natural resources, the design for the new AIA Center for Architecture and Design aspires to be a role model for healthy urbanism for chapter members and future development in downtown Raleigh by: responding to, respecting, and conserving the urban site; integrating building and landscape; promoting both passive and technological sustainable design principles; and bringing activity and delight to the cityscape. A clear example of green architecture, building and landscape were designed as one interlocking system, deferring to the natural topography and reusing every shovelful of earth on the site. The innovative “parking garden”—where porous paving supports automobiles and also functions as a multi-use plaza—eliminates storm water runoff and models an effective solution for urban parking. The parking garden provides an outdoor gathering space for Chapter and community events, expanding AIA NC’s outreach program. All rainwater is collected on site in a landscaped bio-retention planter. A modern shell with a green heart, the building is oriented on the southern edge of the site to leave the majority of the property as an urban park and to make the most of natural lighting and ventilation. The scale of the building focuses on the street context. The north wall greets the Peace Street neighborhood at its natural grade and establishes an urban edge along this rapidly developing transect of the city. Open porches on the south and west elevations welcome the community and underscore a sense of outreach. 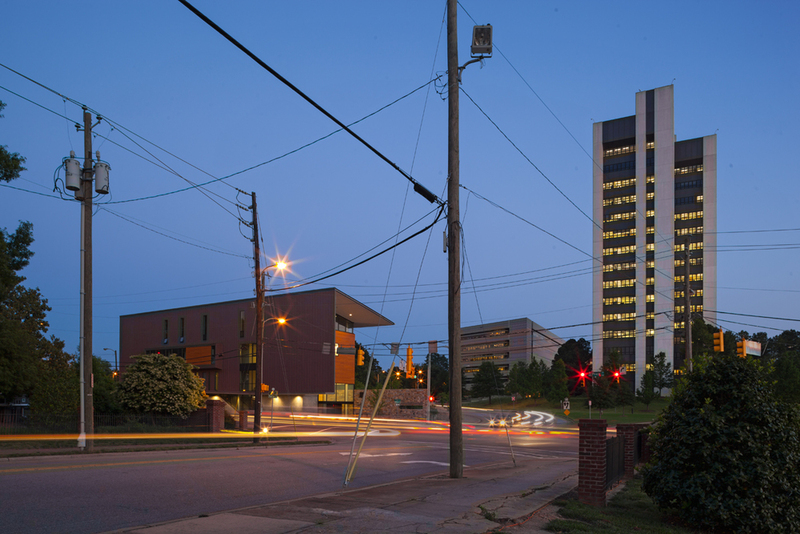 On the north end of the site, structure and landscape rise, both physically and symbolically, to greet the Government Complex along the higher elevation and forge a strong tie with the government entities there. 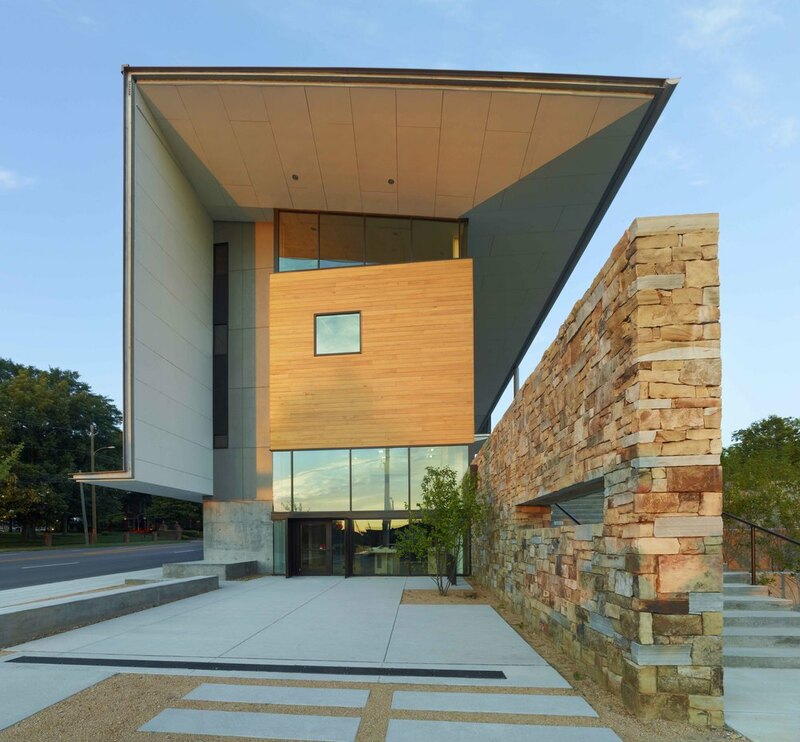 The stone base of the building and stone walls in the landscape anchor the AIA NC headquarters to its site, establishing a sense of permanence. Juxtaposed with glass and steel, the North Carolina cypress siding gives the project a sense of warmth and familiarity in a building that is clearly of its time. The overriding objective of our concept was to demonstrate and encourage aesthetic and ecological integrity – to create a flagship for green architecture in North Carolina that is regionally appropriate and aesthetically inspiring.